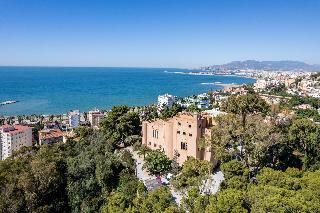 Castillo de Santa Catalina Hotel in Malaga, Hotels in Malaga Hotels & Accommodation in Malaga. The hotel is situated in the exclusive El Limonar area of Málaga, 650 m from La Caleta Beach, about 1.6 km from restaurants and roughly 2 km from the Castillo de Gibralfaro. It lies 3 km from the Picasso Museum and the Carmen Thyssen Museum, and approximately 3.5 km from the centre of the city and Plaza de la Constitucion. Maria Zambrano Malaga railway station is roughly 5 km away, as is the central bus station. 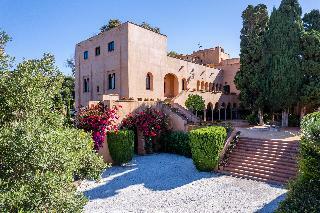 It is about 13 km from Malaga Airport. This charming historical hotel was constructed at the beginning of the 20th century, in the Neo-Arabic style in red terracotta. It is next to the fortress mount of Saint Catherine dating from 1624, and has kept all its historical charm. From its setting, the hotel enjoys spectacular views of the bay of Malaga. Facilities on offer to guests at this air-conditioned establishment include a lobby area with a 24-hour reception and check-out service, a hotel safe and lift access. There is a cafe and a breakfast room and guests will appreciate the free wireless Internet access. They can also take advantage of the room and laundry services and parking is available free of charge for those arriving by car. The interior of each room is individually appointed. All come with a private bathroom with original tiles or marble featuring a shower/bathtub and a hairdryer. They are equipped with a direct dial telephone, a TV with plasma screen, free wireless Internet access and a safe. Furthermore, a minibar, free tea and coffee making facilities and individually regulated air conditioning and heating are provided in all accommodation as standard. The rooms also feature either a balcony or a terrace. Golf enthusiasts will find the El Candado Golf Course only a 19-minute drive from the hotel. Guests may select their continental breakfast from a buffet. Bathroom, YES Disability-friendly bathroom, Shower, Bathtub, Hairdryer, Internet access, Direct dial telephone, TV, Minibar, Tea and coffee making facilities , Individually adjustable air conditioning – , Individually adjustable heating , Safe, Terrace. NO Small pets allowed (under 5 kg), NO Large pets allowed (over 5 kg), NO Wheelchair-accessible, NO Car park, NO Garage, 24-hour reception, Mobile phone coverage, Wired Internet, Wi-fi, Room service, Laundry service, Air conditioning in public areas – , Hotel safe, Lift access, Garden.